From the kitchen of One Perfect Bite...This simple recipe was adapted from one created in the test kitchens of the Hershey Chocolate Company. It came my way as the result of some volunteer activity I was involved in a few years ago. The adaption was develop for a fundraiser, specifically an ice cream social, to which the immediate world had been invited. It was expected to be a huge affair and to assist in cost containment, twenty women were each asked to make a triple batch of the hot fudge sauce featured here today. The plan, of course, was an attempt at quality control and mess containment and it worked pretty well. On the appointed afternoon, approximately 60 quarts of sauce were reheated and served with hot fudge sundaes and banana splits. Despite a volume of hot fudge the size of a rogue wave, the organizers of the event ran shy and had to make a frantic scramble to find enough commercial syrup to assure everyone would get what they paid for. Sticking with my nautical allusions, I can tell you they raised a boat load of cash that day and those of us who made the sauce inherited a nice recipe to keep our dessert collections afloat. I promise you the sauce is better than my humor and I hope you will try it. I also hope you will put your own mark on the recipe. I use a top quality cocoa powder and hazelnut extract when I make this for my family, but bittersweet chocolate and almond extract would also work well. The sauce is best served warm and it will keep for up to a month in the refrigerator. Here's the recipe. Combine sugar, cocoa, flour, and salt in saucepan. Add cream, water, and butter. Cook over medium heat, stirring constantly, until boiling. Cook 5 minutes longer. 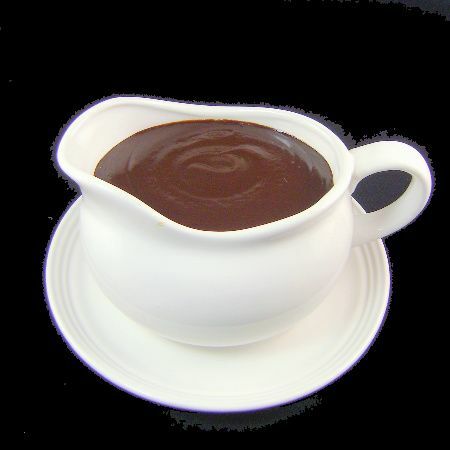 Remove hot fudge sauce from heat, cool, then stir in vanilla. Yield: 3-1/2 cups.